There are two things that make me incredibly nostalgic. First, there is Space. Whether it is LEGO Classic Space, LEGO (less classic) Space from the 90s or Star Wars, it’s one of my oldest Passion. Then there are Dinosaurs. As far as I can remember I’ve loved them. Looking backward, I think it might be because I grew up during a period with many great dinosaurs movies. I could cite “The Land Before Time” and “We’re back! A Dinosaur’s Story“. 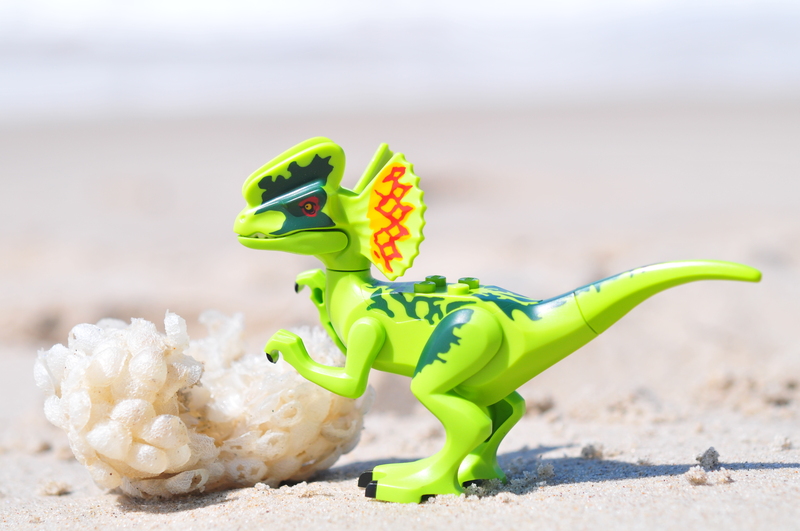 And of course Jurassic Park… It’s partly due to its commercial success (and technical achievement) we now have such great dino toys. The first LEGO dinosaur figures released in 2000 as part of the LEGO Adventurers and LEGO Studio themes. I’ve decided to use our first word of 2018 as a way to reflect on the past year. Specifically, I’ve asked myself what did I create last year? And how did it happen? I’ve found out the answer to creativity is often play. Browsing through my Lightroom catalog, one character stands out of the others: T-Rap. Half Tyrannosaur, half Velociraptor, it’s a simple mix of two LEGO dinosaurs. August 29th is fast approaching and the detailed planning of our very first toy photography meet up on the old continent in the middle of the Stockholm Archipelago is starting to take shape. The warm late summer weather is ordered (with all the rain that is falling out of the sky these days here in Sweden sun will be almost guaranteed as there will be no more water left in the sky) and we are working the detailed schedule of this three day photographic workshop in all things plastic. take me back to the paleolithic era! i recently had the good fortune to interview one of the LEGO designers behind the new jurassic world line-up (look for that piece in the upcoming issue of Bricks). and it rekindled my childhood love of dinosaurs. as a kid, i loved hunting for fossils out at the river (the river being the missouri). i found various shells and plant bits in the shale and marveled that they might be as old as 60 million years, even tho’ i couldn’t really even grasp that number. i always insisted that we stop at every touristy rock shop in the black hills and i scoured the ground on scorching summer days in the badlands of south dakota, hoping to find a tooth from a saber-toothed tiger. i dreamed of being a paleontologist, but abandoned those dreams early, thinking that everything would already be discovered by the time i grew up (back then, growing up seemed so impossibly far away). i thrilled when i read of the discovery of sue, the most intact t-rex fossil ever found – you guessed it – in south dakota. (so i was kind of right, all the good stuff was already discovered.) i loved that sue ended up at chicago’s field museum, where i could visit her, since i was living there at the time. and although i moved to denmark before she was up and on display, i did go back and visit her a time or two anyway. and she is magnificent. all of this came flooding back after my interview with nick and i had to get me some dinosaurs. now, on these long, light summer evenings, i can lay on my belly in the grass in our back yard, posing my raptors and my dilophosaurus in the glorious golden light and dreaming of all those fossils out there, yet to be found. So, I said yes to a photo walk in Seattle the other day. It would be easy, I thought, just another day down by the beach. But, alas, it was not, I should have known. Shooting among the others made me feel naked. NAKED! On the day of the photo walk we met with a small group of really nice people at the statue park, everybody had their gear ready and we just went for it. As I took out my camera (note to self: never leave home without the big camera) and something to shoot, I just couldn’t do it. Not right there in front of others. You know how it is when you’re naked in front of people (come on, everybody has had that dream at least once), it can be quite distracting. I took my little scene away from others in order to concentrate even a little. It didn’t really work. I shot a frame here, another there, everything looked terrible and eventually I just decided to act as if I was photographing. The only thing that was awkward, however, was me. I have never photographed with anyone else in the vicinity. Well, maybe the kid has watched sometimes but it’s different. I saw others go with apparent ease, enjoying the experience and the beautiful day. I was looking for an exit. Then, a kid offered me a red gummi bear candy, it dropped to the ground and I figured that was my chance. I picked it up and yes, I shot a few nice frames of it just like that, on a rock. Then Shelly gave me a dinosaur. The dinosaur and the gummi bear made a swell pair and I took them to a rock near where Wiiman was shooting his scenes. As I was setting the dinosaur and the gummi bear by the shore I fell into the familiar state of flow and everything was right. 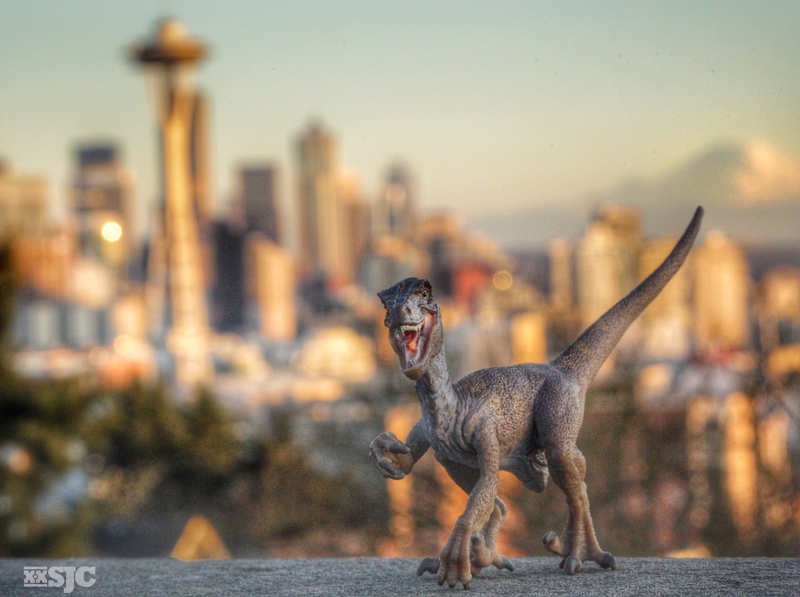 The contemporary urban dinosaur (Bellariavenator Urbanus), surviving on leftovers, preferably candy because of the high sugar content. 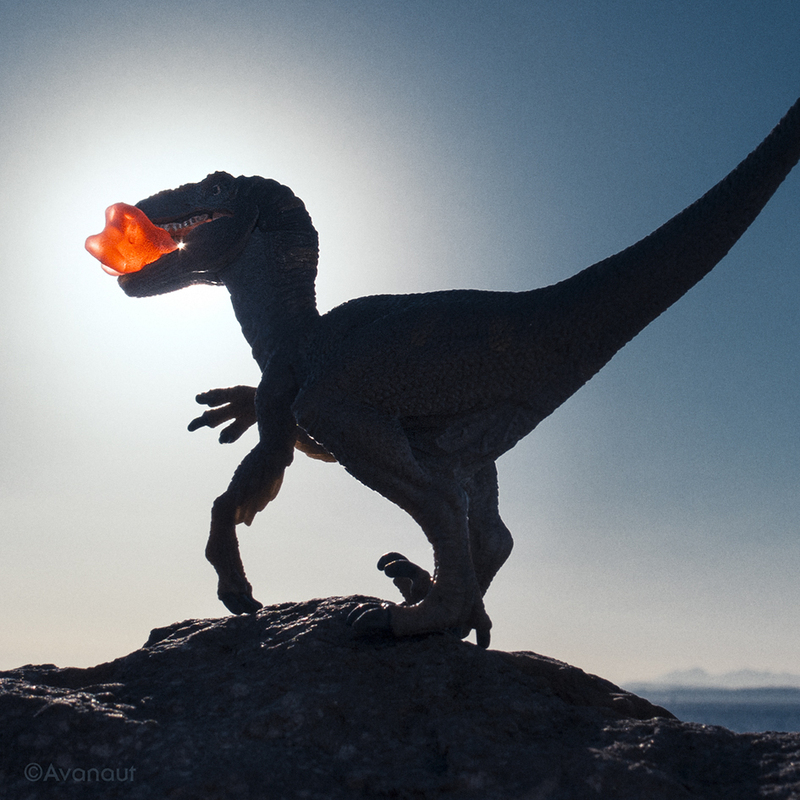 Dinosaurs love candy! I am not used to photographing outdoors, I’ve done it a few times years ago, but as the afternoon was upon us I had experienced a really nice day with fellow photographers, and a moment when I didn’t mind being naked. In LEGO, We Connect has been up for three weeks and I realize that I had some pretty lofty goals for the show. With each passing day I gain a little more distance and have been better able to judge what did and did not happen. So often as an artist you are too close and too emotionally involved to be able to judge what success looks like. I am going to say right off that by any measure this show was a raging success. The amount of press coverage we received was phenomenal and the news still seems to be trickling through the inter-webs. The opening was well attended and everyone who came had a great time. The response to the work was overwhelmingly positive for all three of us. There was even one significant sale. Seriously who can ask for more? When it comes to building a career it is never about instant success. Success might seem like it happened overnight, but it is always built on a series of small advances and forward movement that helps to strengthen you and help you grow as an artist. When I asked Vesa why he agreed to come to Seattle all those months ago, he told me simply that he always says “Yes”. What a great philosophy to live by, I think I will have to do the same. You never know what doors will open for you when you say “yes.” Sure there will be risks (both emotional and financial), but without risk you never know what is possible. For me this experience has definitely enriched my life by the friends I made and the giant step forward my work took. The experience of editing and printing large can never be overstated. It was so far outside my expertise that it was frightening and exhilarating in equal measures. But the joy of seeing my photos large on a wall, rather than on a phone or tablet, cannot be over stated. The press coverage that the show received (and will receive, but more on that later) is only going to help me to continue moving forward. I have faith that a sale might still happen, but that is not how I am measuring this shows success. So what does success look like? It looks like everything else…do the work and enjoy the process.